As the weather improved recently (ok, slightly improved) it was time to dust of the BBQ and get into some outdoor cooking. I am a bit of a snob about BBQs; I don’t want to eat burnt sausages (mainly because I don’t really like them) or shop bought burgers in soggy buns. I like to use the BBQ as a way of getting a different flavour onto meats, fish and veggies and to enjoy the opportunity to eat outside for a change. It is a well known fact that food always tastes better in the fresh air. Oh and that you’ll sleep better after being outdoors for a while…well, so I was told as a child and it works for me! Many people’s experience of BBQs is in a crowd, people have them in the summer and invite a whole load of people round for a big party. Which is great and I love them and it’s a fun and relatively easy way of feeding a group. 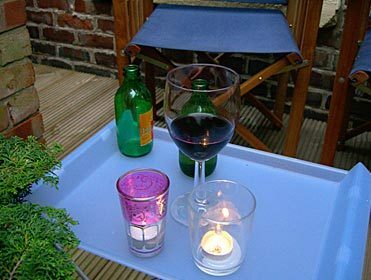 However, I am also a fan of the BBQ for two, and we often have them just the two of us, especially on a Friday evening in the summer when we can just relax and take our time. We don’t have a garden or glamorous patio but we do have quite a sweet backyard, a tiny area really, but it isn’t overlooked, has a tree and enough room for 2-4 people to sit out on a little decked area and space for a BBQ. And as everything looks better with a couple of candles here we go. The first thing I did was make up a sauce. Dom decided what the base of this should be and I tweaked it with a few bits and pieces to make it extra yummy. This is like the sort of BBQ sauce you get in restaurants etc, sweet, sticky, with a bit of warmth. 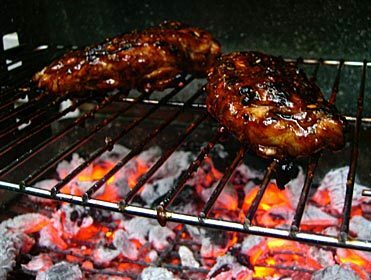 I’m not going to give a ‘recipe’ of how to make this, as it’s really just BBQing chicken which I am sure you know how to do. 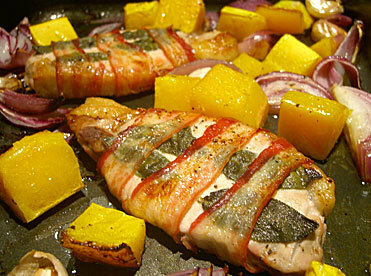 The sauce recipe is below however and just wanted to say that we used organic free-range chicken breasts. I know it’s a bit dull everyone banging on about organic etc but it really does taste better and frankly in the case of chicken if it isn’t free range I am not eating it - battery chicken is cruel and if that weren’t enough it actually doesn’t taste that good either. I try to find organic in the reduced section of supermarket chillers and squirrel it away in the freezer for an occasion such as this. This makes enough for two but if you were having a few people round it can easily be multiplied, just don’t add so much chilli. You can also marinade the meat in a bit of balsamic vinegar and some olive oil to tenderise the flesh – as little as one hour will do it but you can also do before work and leave it all day in the fridge quite happily. The method is simple, just cook the chicken for a few mins on each side to get I going and then start to baste it with the sauce using a pastry brush or similar. Keep basting and turning until chicken is cooked right through. 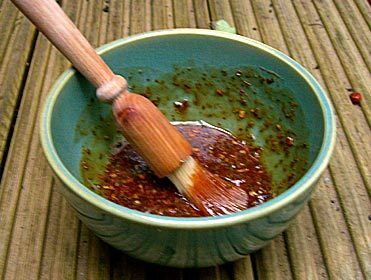 Its best to have this a few inches away from the coals and cook more slowly to allow the sauce to build up and so it catches in places but doesn’t burn too much. 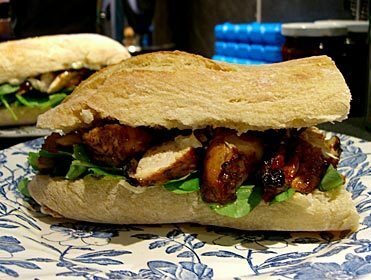 We then carved the chicken into slices and ate in ciabatta bread, with fresh salad leaves from the allotment, some garlic mayonnaise and a nice glass of shiraz. It felt good to be finally sat outside in the twilight eating something delicious (ethical!) and so easy to make. I would love to hear about other people's BBQ sauces and recipes. what's the best thing you have ever cooked on a BBQ? This dish has been inspired by both Saint Delia and my colleague Gillian. I was looking for something worthy of celebrating our friend Sunila’s birthday and that I could do as a week day meal without killing myself. It did mean that I had to nip home mid afternoon and turn the oven on but hey, when you can drive to home and back in 15 minutes it’s no great hardship. I should also explain that this dish and the occasion of eating it with Sunila and Dom is the culmination of a year long campaign by them to get me to eat lamb. It is their very favourite meat and it annoyed them greatly that I refused to share in their pleasure. Because I am such a good wife and friend and let’s face it, a total people pleaser, I have been on a mission to like lamb and have been trying it every so often so that it got to the point, the tipping point, where I decided that it was actually quite delicious. Prior to this, I even went so far as to say it was ‘yucky’ and ‘smelled disgusting’ and that I would ’never, never eat it’. Well, I am now eating my words. And the lamb. Put veggies and herbs in the bottom of a large casserole dish (must have a lid, more later). Preheat the oven to 140 degrees C or the equivalent. Cover the dish with foil tightly and the put the lid on. Put in oven for at least 4 hours, but 6 is better. 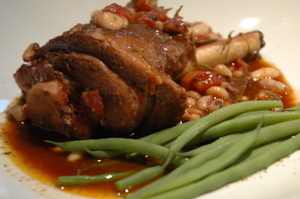 About 45 mins before you intend to eat, add the beans and take out a few ladles of stock to reduce to a sauce in a pan. Add some slaked corn flour – about 1 teaspoon of flour in about a tablespoon of water will do the trick – and add to the sauce. Serve each person with a shank, some of the beans and veggie mix and some of the thickened sauce. 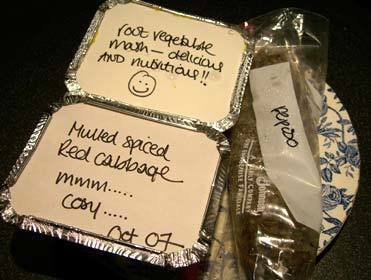 We had this with fine green beans which looked great on the plate (as you can see!) and big glasses of red wine. What was great about this dish is that it was so easy, very little prep and it really just makes itself, using ingredients that practically leap off shelves they are so easy to find. You could skip the sauce making stage and just serve the liquor like a broth around the shank too. The loveliness of the taste is inversely proportionate to the amount of time and effort needed. One of those dishes that you feel slightly guilty for being praised so highly for (or is that just me?) but as a self confessed people pleaser, let’s just say I got my fix!